"What concerns me when I work, is not whether the picture is a landscape, or whether it's pastoral, or whether somebody will see a sunset in it. What concerns me is - did I make a beautiful picture?" Helen Frankenthaler was among the most influential artists of the mid-20th century. Introduced early in her career to major artists such as Jackson Pollock and Franz Kline (and Robert Motherwell, whom she later married), Frankenthaler was influenced by Abstract Expressionist painting practices, but developed her own distinct approach to the style. She invented the "soak-stain" technique, in which she poured turpentine-thinned paint onto canvas, producing luminous color washes that appeared to merge with the canvas and deny any hint of three-dimensional illusionism. Her breakthrough gave rise to the movement promoted by the influential art critic Clement Greenberg as the "next big thing" in American art: Color Field Painting, marked by airy compositions that celebrated the joys of pure color and gave an entirely new look and feel to the surface of the canvas. Later in her career, Frankenthaler turned her attention to other artistic media, most notably woodcuts, in which she achieved the quality of painting, in some cases replicating the effects of her soak-stain process. While creating Mountains and Sea (1952), Frankenthaler arrived at her innovative variant of Jackson Pollock's pouring technique, in which she likewise poured paints onto enormous canvases placed on the floor. But while Pollock used enamel paints, which remain on the surface of the canvas when dried, Frankenthaler poured oil paints that she had thinned with turpentine that then soaked into the fabric of the canvas. Frankenthaler's soak-stain process created luminescent, misty compositions dominated by large areas of color that seemed to have emerged onto the canvas naturally and organically. Frankenthaler's work influenced Morris Louis and Kenneth Noland, who recognized works like Mountains and Sea as a mode of abstract painting that moved beyond Pollock's textured, psychologically fraught canvases to compositions almost entirely based on color. On the basis of the soak-stain technique and the color wash, Frankenthaler, Louis, and Noland went on to develop Color Field Painting. In such works, the entire space of the picture is conceived as a "field" that appears to spread beyond the edges of the canvas; figure and ground became one and the same, and three-dimensional illusionism is completely jettisoned. In another major departure from first-generation Abstract Expressionism, Frankenthaler was an abstract artist for whom the natural landscape - rather than the existential confrontation with the canvas or search for the sublime - served as the major focus and inspiration. Her pared-down forms were often informed by her impressions of nature, be they the arid terrain of the American Southwest; a mulberry tree seen in upstate New York; or the Long Island Sound, viewed from the artist's home in Darien, Connecticut. 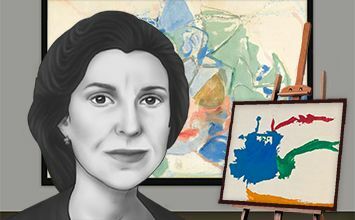 Frankenthaler applied her breakthrough soak-stain technique to other painterly media, most notably, watered-down acrylic, which she used in place of turpentine-thinned paint starting in the 1960s. Subsequently, she also sought to replicate the method's effects in printmaking, creating woodcuts that not only resembled paintings, but also achieved the misty, watercolor-like quality of her color washes. 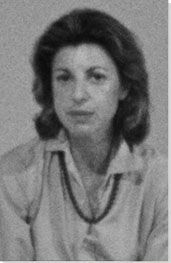 Helen Frankenthaler was born and raised in a wealthy Manhattan family with her two older sisters. Her parents recognized and fostered her artistic talent from a young age, sending her to progressive, experimental schools. The family took many trips in the summertime, and it was during these trips that Frankenthaler developed her love of the landscape, sea, and sky. Her father was a judge on the New York State Supreme Court and died of cancer when she was eleven years old. The loss affected her deeply, sending Helen into a four-year period of unhappiness during which time she suffered from intense migraines. This canvas is the artist's landmark piece in which she first pioneered her soak-stain process. Despite its large size (7 x 10 feet), it is a work of quiet intimacy. Painted on the artist's return from Nova Scotia, Mountains and Sea retains the artist's impressions of the Cape Breton environs; as she famously described, the region's landscapes "were in my arms as I did it ... I was trying to get at something - I didn't know what until it was manifest." Here, color takes on a new, primary role, with washes of pink, blue, and green defining the hills, rocks, and water, the forms of which are sketchily outlined in charcoal. Following their encounter with Mountains and Sea and other works by Frankenthaler produced by means of the soak-stain technique, Morris Louis and Kenneth Noland promptly embraced the method and, together with Frankenthaler, launched the "next big thing" in American art: Color Field Painting. The topographical features of the landscape often served as inspiration for Frankenthaler's abstract imagery. With its brilliant red wash filling most of the canvas, Canyon reflects the change in Frankenthaler's artistic practice introduced several years earlier, when she began replacing turpentine-thinned oil with watered-down acrylic poured in larger stains and blots. The painting's gentle luminosity evokes the art critic Nigel Gosling's 1964 description of Frankenthaler's work, written in connection with the artist's London gallery exhibition of that year: "If any artist can give us aid and comfort, Helen Frankenthaler can with her great splashes of soft color on huge square canvases. They are big but not bold, abstract but not empty or clinical, free but orderly, lively but intensely relaxed and peaceful." Depicting an open space above a mountain-like divide, Savage Breeze was Frankenthaler's first foray into the medium of woodcut. Her concern in this work with achieving the same vibrant color and amorphous forms as her painting resulted in a major technical innovation for this art form. The artist cut a thin sheet of plywood into separately inked shapes and then, in collaboration with ULAE (Universal Limited Art Editions), the Long Island studio that printed the work, devised a special method for eliminating the white lines between them when printing. The newly designed technique - hailed by one writer as "a departure so profound that virtually all subsequent woodcuts incorporated the thinking it embodied" - had a major impact on subsequent printmaking. Indeed, Savage Breeze is far removed from the graphic appearance of the traditional woodblock print, giving the appearance of painted, rather than carved, wood. With its minimally defined forms and earthy palette, Desert Pass is an excellent example of the ways Frankenthaler responded to the natural landscape. Inspired by a trip to the American Southwest, the painting captures the colors and forms as well as the climate of the region. Among them: yellow-gold, evoking sand as well as the desert's aridity and intense light and greenish-blue, suggesting the form and color of cacti. An eight-color woodcut, Essence Mulberry consists of a large bluish gray area containing orange markings, framed by two broad stripes of rich red. The print's palette had sources in both art history - the faded colors of 15th-century prints Frankenthaler encountered at the Metropolitan Museum of Art - and nature: a mulberry tree located outside Kenneth Tyler's printmaking studio in New Bedford, New York. Using mulberry juice to capture the tree's rich red, the artist achieved the quality of painting - defying the graphic nature and helping expand the possibilities of the medium. Printed by Tyler Graphics, Essence Mulberry was the first of Frankenthaler's many collaborations with the master printer occurring over a roughly twenty-five year period. Although the central white shape suggests a butterfly, this print evokes rather than depicts its subject, with a sense of delicacy appropriate for the Japanese heroine of Puccini's tragic opera of the same name. Frankenthaler's final collaboration with Tyler Graphics, Madame Butterfly is an incredibly complex work, involving 106 colors, 46 woodblocks, and measuring 6' in length. Both its subject and the manner in which the print was created, using traditional Japanese Ukiyo-e carving techniques, reflect the artist's sustained engagement with Asian art and culture. With its color washes, floating forms, and watercolor-like effect, Madame Butterfly is reminiscent of works like Mountains and Sea - a seeming realization of the soak-stain technique in the medium of woodcut.